In our previous discussion we came across "XML response with @ResponseBody annotation (Spring + XML)". 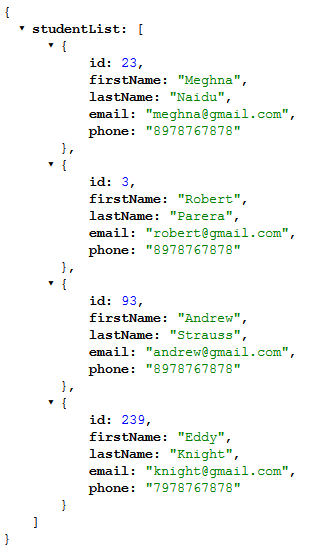 Today we will see how to return a JSON response from a Spring MVC Controller. All we need to do is adding @ResponseBody annotation in front of controller and adding 'jackson-mapper-asl' dependency to the classpath. Let's see the functioning of @ResponseBody annotation and how it helps in returning an java object in JSON form. In a spring mvc project we need to add a 'jackson-mapper-asl' dependency to the pom.xml file, and object to json conversion is done bydefault. Second thing we need to do is to use '@ResponseBody' annotation against the controller's method. This will make spring understand that method return value should be bound to the web response body. That's all we need to know about @ResponseBody annotation and how to return JSON response from Spring Controller. Lets now add all other useful files to our project to make it working. 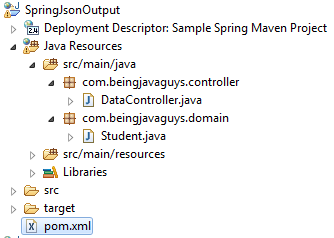 Dependencies required to return JSON response from Spring Controller. This is simple spring configuration file, we have added an entry for our controller's location. Dont forget to add '<mvc:annotation-driven />' this is very important for @ResponseBody annotation to work. If everything goes right and you have configured everything well, run the projct on server and hit following two URL's in the browser. You can also download full example project from the link given below in BLUE STRIP. In upcoming blogs we will see more about Spring, Hibernate, Java and Other opensource technologies. Download source code from: GitHub.